Remembering Memorial Day Weekend 2008 | H.B. Charles Jr. I landed at LAX from preaching. My cell phone rang as soon as I turned it on. 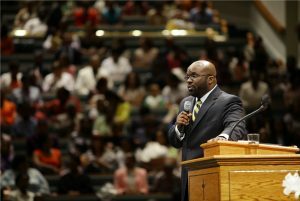 When I answered, a friend chastised me about not responding to a message from the deacon chairman of the Shiloh Metropolitan Baptist Church in Jacksonville, Florida. There were no messages on my phone. No messages at home or the office, either. Then it came to me. I rarely used the phone in my study, and didn’t even know the number. But I asked my assistant to check the phone and, sure enough, a deacon from Florida had left a message. My friend told the chairman I was someone the church should hear. He called to invite me to speak. As he described what the church was looking for, I did not fit any of the qualifications. Not old enough. Not enough formal education. Did not pastor a church large enough. The deacon was not rude. But he wanted it to be known that it was only a speaking engagement. I was not offended. They were not interested in me. And I was not interested in them. We haggled over dates. He asked me to come on Mother’s Day. Absolutely not. We finally landed on Memorial Day weekend. Before my visit, I learned that the church no longer wanted to hear speakers who were not candidates; but instead of rescinding the invitation, I was asked to meet with the pulpit committee. I reluctantly consented. I went to my study at the church early one morning. As I began to work, my phone rang. It was another deacon from the Jacksonville church. He encouraged me to bring my “A game,” because there were those who thought I should be the church’s next pastor. After the brief conversation, I drove back home. I woke my wife, Crystal, to tell her about the conversation. She asked, “What does that mean?” “I don’t know,” was my answer. We just sat there staring at one another. We prayed and hung up. But I could not sleep. 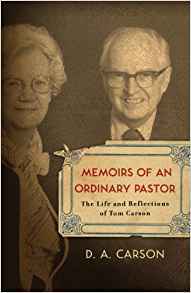 I decided to finish the book I started on the plane, entitled, “Memories of an Ordinary Pastor,” by D.A. Carson. Then I really couldn’t sleep. I confessed my desire to pastor a larger church. And I asked the Lord to make me content with obscurity to be faithful to his will. I went to bed even more confident that Shiloh was not in my future. The next morning, I preached the two morning services at Shiloh. They put a lapel microphone on me, which I had only used a handful of times before. I lost my voice ten minutes into the sermon. I took it as further proof that Jacksonville was not in my future. I had a burden to preach something encouraging to the troubled congregation. They obviously received it. But I failed to notice a connection was established. After I changed clothes, the men asked me to visit again in July. I refused. They took me to lunch. Dropped me off at the airport. I boarded the plane and went to sleep, thinking more about the upcoming holiday than the events of the weekend. Later that week, I had lunch with a friend. I noted he had not mentioned my Jacksonville visit. There was a long pause. Then he blurted out, “Man, you’re headed to Jacksonville to pastor that church.” I laughed so hard I almost fell out of my seat. Praise the Lord I was wrong!